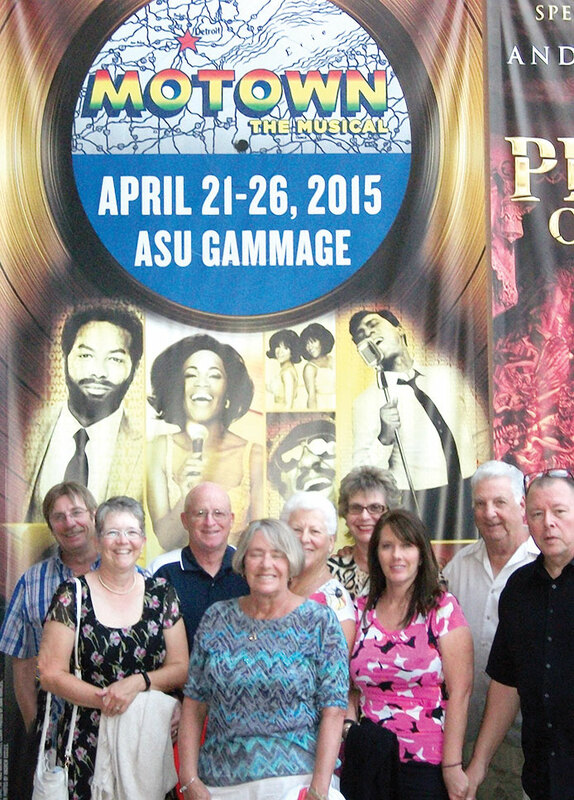 On Tuesday evening, April 21, 2015, 34 members of the Show-Goers Club attended opening night of Motown the Musical at ASU Gammage in Tempe, AZ. Motown the Musical has been called a “Broadway jukebox musical” because 60 songs highlight this show. With a book by Berry Gordy based on his 1994 autobiography To Be Loved: The Music, the Magic, the Memories of Motown, the musical is based on the story of Gordy’s founding and running of the Motown record label and his relationships with Motown artists such as Diana Ross, Smokey Robinson, Marvin Gaye and Michael Jackson. The music and lyrics for the musical are taken from selections from the Motown catalog. The musical premiered on Broadway in April 2013 and it received four Tony Award nominations. Club members were also favorably impressed by the show’s music. Show-Goers is a chartered club at Robson Ranch and has over 100 members. The purpose of the club is to provide opportunities for members to enjoy the performing arts. The club does not collect dues, but members are required to coordinate or co-coordinate a show every three years to maintain their good standing in Show-Goers. October 19, 2015: The Book of Mormon at ASU Gammage at 7:30 p.m.
December 10, 2015: A Christmas Carol-The Musical at Arizona Broadway Theater at 2:00 p.m.
January 8, 2016: Riverdance at Broadway in Tucson at 8:00 p.m.
February 21, 2016: The Book of Mormon at Broadway in Tucson at 2:00 p.m.
March 10, 2016: Fiddler on the Roof at Arizona Broadway Theater at 2:00 p.m.
March 19, 2016: Gentleman’s Guide to Love and Marriage at ASU Gammage at 2:00 p.m. If you have questions, wish to attend one of these shows or wish to join Show-Goers, you should contact one of the Board Members: Larry Kostroski 520-421-2129, Mike Lesica 920-288-7577 or Bob Engelhardt at 520-466-5229.